A disliker of slow walkers, clingfilm, and umbrellas. It’s common for everyone to enjoy the odd night out every now and again, and it seems that professional athletes, in this regard, are no different from us. Last week, New Zealand rugby fly-half Aaron Cruden missed the team’s trip to Argentina as the result of a night spent out on the town. Although it has been reported that he was not the only member of the squad to be out drinking, he was the only one who failed to show up the next day for the flight to Buenos Aires. All Blacks head coach Steve Hansen was quick to discipline Cruden who, with star fly-half Dan Carter out injured, has been instrumental in New Zealand’s unbeaten start to the Rugby Championship. He will now miss the remainder of the All Black’s fixtures in the tournament, which could seriously damage his chances of a place in the squad for next year’s World Cup in England. Hansen has since expressed his surprise and disappointment at Cruden’s actions, saying that they were completely out of character, whilst the player has also apologised and expressed his embarrassment at the whole ordeal. While it may have been out of the ordinary for Cruden to behave in such a way, it is not unusual for other athletes to sometimes hit the booze. The 2011 Rugby World Cup in New Zealand saw English players enjoy a night out after an unconvincing win over Argentina in their opening game. Although there is nothing too damning about these actions – it is common for players to celebrate a win with a few drinks – the controversy was generated by photos of players looking slightly worse for wear and taking part in a drunken dwarf throwing contest. Fall-out from this was limited to a telling off by head coach Martin Johnson, but did supposedly spark incidents of dwarf throwing by England fans, leading to one becoming paralysed. English rugby players aren’t the only ones who have got in trouble at World Cups. Famously, in 2007, English cricketing hero, Andrew Flintoff needed rescuing from the Caribbean Sea at four in the morning, having fallen off a pedalo whilst under the influence. ‘Pedalo-gate’, as it became known in the media, came on the back of a heavy defeat for England against New Zealand at the World Cup in the West Indies. 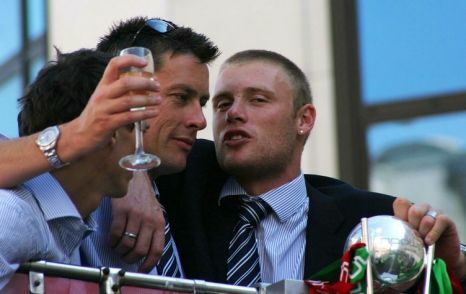 Flintoff, along with six other members of the squad, decided to drown their sorrows at a local nightclub before hijacking the pedalo; an idea which saw Flintoff dropped as vice-captain and suspended for their following match against Canada. Despite this it seems that his drunken escapades did not damage his image among English fans, but instead enhanced his reputation as he was supposedly cheered through the hotel lobby following his apologetic press conference. However, perhaps the most memorable example of an athlete making the news for their love of drink was Paul Gascoigne in 1996. Having already qualified for the European Championships due to their status as hosts, the English national team played a number of friendlies instead. Following their final match before the tournament, pictures surfaced from a bar in Hong Kong of Gascoigne lying in a chair while spirits were poured into his mouth. Although there were no official ramifications, the public were outraged, but it was Gascoigne who had the last laugh as he scored a beautiful goal against Scotland at Wembley and celebrated by lying on the ground while teammates squirted Lucozade into his mouth. England reached the quarter-finals and the Daily Mirror issued an apology to the midfielder, describing him as a “football genius”. It seems then that athletes will not be putting down the bottle anytime soon, and why should they. They are, like us, just people, under constant public scrutiny and deserve to relax and unwind every now and again. Unlike us however, their nights out can result in suspension, public derision and heavy fines: count yourself lucky the next time you wake up with ‘just’ a hangover.